(CNN) -- A Kansas judge on Tuesday ordered an anti-abortion activist to stand trial in the death of a Wichita doctor who was gunned down at his church. 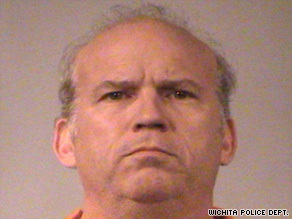 Scott Roeder is charged with killing Dr. George Tiller at a Kansas church. Scott Roeder, 51, pleaded not guilty after being bound over to trial on charges of first-degree murder in the death of Dr. George Tiller, who ran a women's clinic in which he performed abortions. Tiller was shot to death May 31 as services began at Reformation Lutheran Church. Roeder also faces two charges of aggravated assault for threatening church members Gary Hoepner and Keith Martin. Sedgwick County Judge Warren Wilbert scheduled Roeder's trial for September 21. During a preliminary hearing Tuesday, Gary Hoepner, an usher and 52-year member of the church, testified he was talking with Tiller before services when a man walked up to them, "put a gun right up to George's head and shot it." Hoepner said he heard only a small "pop" and wondered if the gun might have been a cap gun. But he said he knew he was wrong when Tiller fell. Wearing a white shirt and gray jacket with a maroon tie, Roeder listened intently to the testimony Tuesday without expression. Hoepner and another usher, Keith Martin, both testified during the daylong hearing that they pursued the shooter out of the church. Hoepner said the man yelled at him that he had a gun and would shoot them. Church member Thornton Anderson testified he had been running late and had difficulty finding a parking space. As he left his car, he saw two men following a third and heard someone yelling, "Get the tag number!" as the first man got into a car. He did, and ran to Hoepner to give it to him, he testified. Hoepner identified Roeder as the man he saw that day, and testified he had also seen him at the church the Sunday before the incident. Church members told him the man had placed a note in the church's collection plate, Hoepner said, and that the same man had done so previously. Anderson also said he had seen the man at the church, saying he remembered the man was balding and "his clothes didn't match very well." Church members were suspicious of him, Anderson said under cross-examination by Roeder's attorneys, because "nobody knew who he was and nobody knew why he was there." Martin testified that Tiller was absent from church the previous Sunday, May 24. Martin said when the shooting occurred, he heard a loud noise and saw Tiller on the floor. He looked out the window, he testified, and saw a man running away from the church. It was the same man he had seen at church several times previously, he said, although he did not know on what dates. He said he had noticed the man "had a horrible smell about him. ... It wasn't just somebody at the gym smell. It was something more, an ammonia-type smell." He identified Roeder as the man he had seen. He said he pursued the man, who then pointed the gun at him. Martin said he could see "straight down the barrel" before he got out of the way and the man escaped. On cross-examination, Martin said the church has been targeted for protests in the past, with at least some of them coming because of Tiller's membership and his occupation. Tiller was shot in the head at close range, according to testimony Tuesday from Jaime Oeberst, chief medical examiner for Segwick County. This preliminary hearing is a sort of mini-trial, as the prosecution lays out its case against the suspect. Roeder is jailed on a $20 million bond. Wilbert increased the bond fourfold after Roeder spoke to news organizations, including CNN. In a June 9 jailhouse interview with CNN's Ted Rowlands, Roeder stopped short of admitting he shot Tiller, but said that if he is convicted, "the entire motive was the defense of the unborn."